Here is my second venture into radio. A feature on the villages of Umm Al Heran and Attir, which are slated for demolition by Israel’s governmental authorities. Young Tasneem Abu Al Qian was my guide. First broadcast on FSRN. Below is the full transcript and to listen click here. Israel has large scale development plans intended to attract new populations to the Negev desert and turn its southern peripheral region into a military and technology hub. Indigenous Bedouins in the area say the ambitious designs do not take their needs into consideration and will only deepen the historical mistrust between the Israeli government and its Arab Palestinian minority. Reporter Silvia Boarini visited Umm Al Heran and Attir, two unrecognized Bedouin villages facing the threat of demolition, and files this reports. It’s mid afternoon in Umm Al Heran, a quaint Bedouin village nestled on the rolling hills of the Negev, in southern Israel. Local resident Tasneem Abu Al Qian points to stands of olive trees, to jerrycans used to haul water and to solar panels that generate electricity for the village. Established in its current location by military order in 1956, after the army forcibly displaced the semi-nomadic tribe from their ancestral lands, Umm Al Heran has never been recognized by Israel as a legal settlement and still doesn’t receive any basic services, such as water or electricity through the grid. Twelve-year-old Tasneem Abu Al Qian has lived here all her life but she knows her future is uncertain. Human rights organizations working in the Negev believe the eviction of the 1,100 Bedouin residents of Umm al Heran and neighboring Attir, is strictly linked to multi-billion dollar development plans that Israel is implementing in the area. Umm Al Heran and Attir are two of 35 villages in the Negev without official recognition from Tel Aviv. They are home to 70,000 Bedouins and often pre-date the state of Israel. In 2011, in an attempt to “regularize Bedouin settlements” the government adopted the Prawer Plan, which proposed to demolish all 35 villages and transfer the population to existing townships and recognized settlements. In 2013, following widespread outcry, the plan was supposedly shelved. But activists say it is moving forward in practice. In May of last year, after a 14-year-long legal battle, Israel’s Supreme Court ruled that the state can demolish the villages of Umm Al Heran and Attir, build a Jewish settlement and plant a forest on top of them, and displace their 1,100 inhabitants to nearby Hura, one of seven townships planned by the government since the ’60s to urbanize the Bedouins. The Bedouin community and Jewish and international activists working with them, believe the only sensible solution is to recognize the villages. Haia Noach, director of the Arab-Jewish human rights NGO Negev Coexistence Forum, does not accept the state’s explanation that providing infrastructure to unrecognized Bedouin villages is too costly. 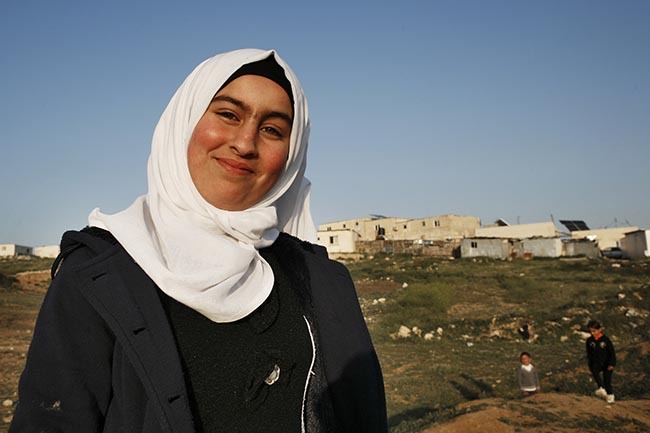 Back in Umm Al Heran, Tasneem has no doubt that the state is making a big mistake. Near Tasneem’s home, Jewish National Fund bulldozers have already begun preparing the land for tree planting. No one in Umm Al Heran or Attir knows when the eviction will take place but they vow to continue fighting to win recognition for their village and their rights as citizens.